For those who are looking for a traditional design, this range is a first-class choice. Created for different residential areas, the typical prayer rug design and the bushy fringes give a warm, welcoming look to any room or decor. Featuring intricate floral designs inspired by silk rugs which have been woven for 1000's of years in and around Iran and China. Jordan is traditionally designed but they would also blend with plain or contemporary décors. The colours and shades are pastel and subtle but bold enough to enhance most homes, this range would add warmth and -elegance to most interiors. 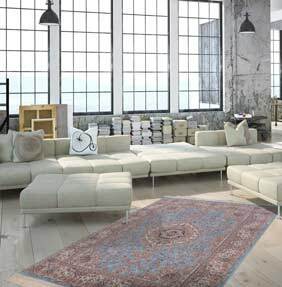 Jordan rugs are machine woven in the EU, the pile is made from 100% mod-acrylic. Choose from 6 designs and 4 size options.